The author is graduated in Electronics & Telecommunication. During his studies, he has been involved with a significant number of projects ranging from programming and software engineering to telecommunications analysis. He works as a technical lead in the information technology sector where he is primarily involved with projects based on Java/J2EE technologies platform and novel UI technologies. 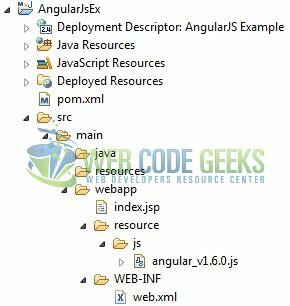 Hello readers, in this basic example, developers will learn what AngularJS is and how to start writing the code using the AngularJS framework. 1.2 Why should we use AngularJS? In AngularJS, a template is an HTML with additional markups. AngularJS library compiles the templates and renders the resultant HTML page. The following table lists all the important concepts in AngularJS library. Template An HTML with additional markups. Directives Extend the HTML with the custom attributes (or markers) and elements. Model It is the data shown to the user in the view with which the user interacts. Scope A Scope is a context where the model is stored so that controllers, directives, and expressions can access it. Compiler The Compiler parses the template and instantiates the directives and expressions. Filter A Filter formats the value of an expression for display to the user. Data Binding This sync the data between the model and the view. Controller It maintains the application data and business logic. 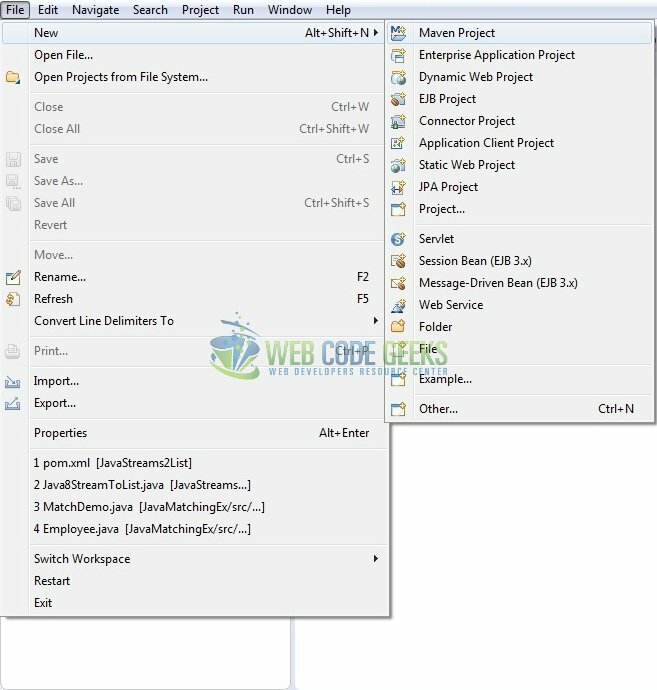 Module It is a container for different parts of an application including the controllers, services, filters, and directives which configures the Injector. Service A Service is reusable business logic which is independent of the views. Using the Model-View-Controller architecture, the framework separates a web application into a simple and yet manageable structure, which comprises of “views”, “models” and “controllers”. The AngularJS library provides the in-build directives (or attributes) to extend the HTML inside a web page. When developers attach these directives to the HTML elements and attributes, it creates a dynamic web-page with very little coding. These new APIs make a developer life easier, really! But it would be difficult for a beginner to understand this without an example. Therefore, let us create the first application using the AngularJS library. Here is a step-by-step guide for implementing the Servlet framework in Java. We are using Eclipse Kepler SR2, JDK 8 and Maven. Having said that, we have tested the code against JDK 1.7 and it works well. Firstly, let’s review the final project structure, in case you are confused about where you should create the corresponding files or folder later! 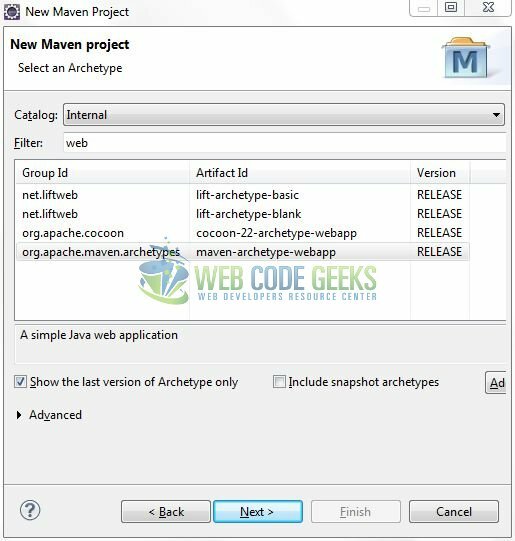 This section will demonstrate on how to create a Java-based Maven project with Eclipse. In Eclipse Ide, go to File -> New -> Maven Project. 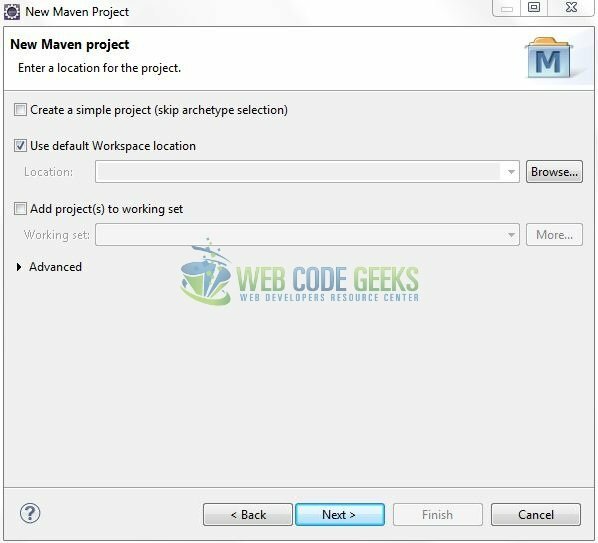 In the New Maven Project window, it will ask you to select project location. By default, ‘Use default workspace location’ will be selected. Just click on next button to proceed. 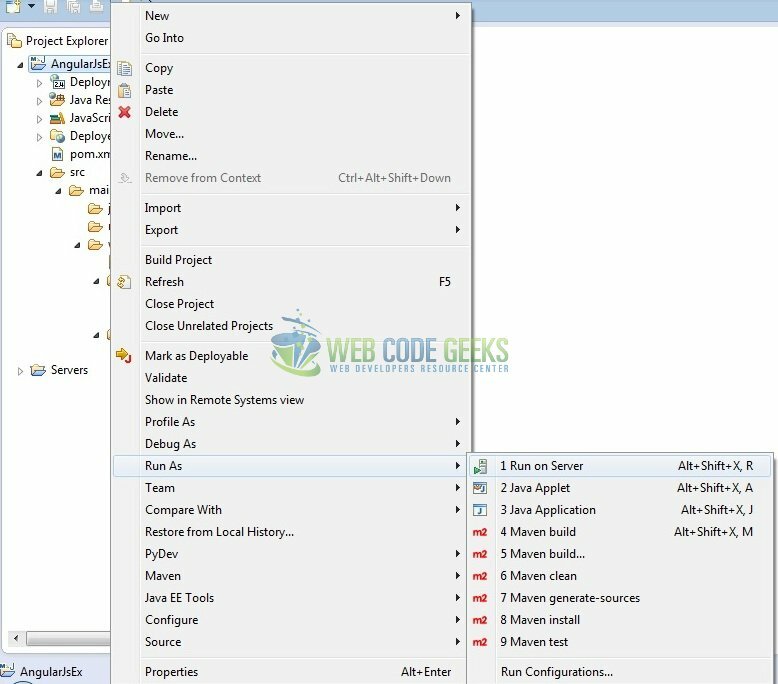 Select the ‘Maven Web App’ Archetype from the list of options and click next. It will ask you to ‘Enter the group and the artifact id for the project’. We will input the details as shown in the below image. The version number will be by default: 0.0.1-SNAPSHOT. Let’s start building the application! Let’s create a basic welcome application to understand the basic building blocks of AngularJS library. Next, we will define the AngularJS application using <ng-app> directive. In this step, we’ll define a model <name> using <ng-model> directive. Complete all the above steps and save the file. Let’s see the sample code snippet. As we are ready for all the changes, let us compile the project and deploy the application on the Tomcat7 server. To deploy the application on Tomat7, right-click on the project and navigate to Run as -> Run on Server. Tomcat will deploy the application in its web-apps folder and shall start its execution to deploy the project so that we can go ahead and test it in the browser. Open your favorite browser and hit the following URL. The output page (i.e. the welcome form) will be displayed. Server name (localhost) and port (8082) may vary as per your Tomcat configuration. Developers can debug the example and see what happens after every step. Enjoy! Once a user enters the name of the person, a welcome message will be immediately printed on the screen. That’s all for this post. Happy Learning!! 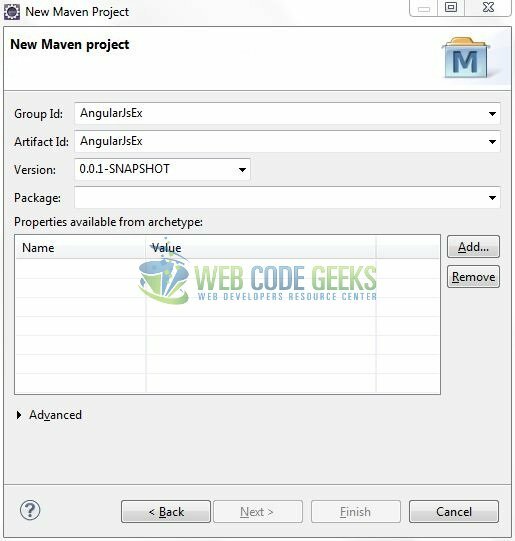 In this section, developers learned how to create a simple application using the AngularJS library. Developers can download the sample application as an Eclipse project in the Downloads section. I hope this article served you with whatever developers were looking for. This was an example of AngularJS library for the beginners.